NEW TELEPHONE NUMBER: 212.501.2222 - New York City, NY - USA. Dean Kraft gives his own explanation of his Energy Healing Therapy (also known as Psychic Healing and non-religious laying on of hands)……. “In my opinion, Energy Healing activates the Mind/Body Connection. Energy healing can unblock and balance the patient’s natural energy fields in order to catalyst their own healing system to start to correct itself, to function properly. As I try to help someone with a health problem, I visualize the area or areas that are diseased. For example – if a person has liver tumors that medical science has deemed ‘hopeless’, I would then “see” or “imagine” the tumors shrinking – and most of the time, this action actually creates a physical change. Some of the time, I work just above the body’s surface – the ‘auric body’ that extends up to a few feet from the patient’s skin. Other times, I very gently touch the head and neck areas and work on certain energy points on their limbs to stimulate the blood circulation, which carries the energy throughout the body. There is a very INTUITIVE process to my energy healing work. As well, while I’m working with the person, I’ll frequently have them use various visual techniques during the session to A) get them more relaxed, making them more open to absorb my energy and B) have the patients actually participate and stimulate their own ‘mind/body connection’ and visualize themselves shrinking their Own tumors and “seeing” themselves well, doing some activity they enjoyed doing before they became ill. Herein lies the Mind/Body Connection." The fact that Dean Kraft has subjected himself to medical and scientific investigation over these many years and has achieved such successful results is what always set him apart from all other Energy Healers. Dean Kraft has been an energy healer for the last 35 years. He has helped the majority of the people that sought him out -- those that medical science have given up on. Dean has become world-renown because he is the most medically documented and scientifically studied laying-on-of-hands energy healer. This is due in no small part to his amazing success rate and his willingness to subject himself to paranormal, medical, healing, and scientific research. Dean Kraft is not a medical doctor - and does not practice medicine in any way, shape, or form. Dean Kraft is the only non-religious laying-on-of-hands energy healer that works successfully with most forms of cancer. In many cases he has been the catalyst of full remissions and complete cures for people suffering with the worst types of malignant metastatic cancers known to mankind. These are cancers that have spread throughout numerous organs, as well as, in some cases, into the patients' lymphatic system. Some examples -- liver, pancreas, kidney, lungs, breast, ovarian, cervical, prostatic, brain tumors such as glioblastoma multiforme and other brain malignancies. His successes are validated by all of the known testing procedures performed by traditional Western medicine (MRIs, CTs, PET scans, X-rays, sonograms, bone marrow tests, blood studies, etc.). Other cancers like Leukemia, Hodgkins, and Multiple Myeloma have also been positively responsive to Dean's treatment. As well, the patients' own subjective impressions of the severity of pain, fatigue level, and overall improvement in the quality of their lives and more hopeful frame of mind are all taken into account. Just the fact that they have survived - living their lives many years past their doctor's dire prognosis is proof in itself. There are patients today that Dean saw over thirty-five years ago that remain cancer free. Dean has also seen many people with neurological problems -- the worst of them being ALS (Lou Gehrig's Disease), especially the bulbar form. He is the only healer known to have ever completely reversed and cured a quadriplegic ALS bulbar patient, with literally weeks to live. Her respiratory system was failing. This case has been documented on video tape, monitored by physicians, and seen worldwide on the media. Dean has helped many other ALS patients to all varying degrees. In addition to working with this neurological nightmare, Dean has also created positive effects with people suffering from stroke, paraplegia and quadriplegia due to various causes, neuropathy, multiple sclerosis, and numerous other neurological conditions. Gratefully, not all problems that Dean takes on are as severe or terminal as those previously mentioned. He also works with orthopedic problems like shoulder rotator cuff pain and lack of mobility, tennis elbow, and knee cartilage conditions. Ailments such as back pain from herniated disks, sciatica, scoliosis of the spine (curvature), and ankylosing spondylitis (Marie Strumpel disease) are a few examples of health problems that doctors have limited help for and that Dean has worked with successfully. Osteo and rheumatoid arthritis, eye disorders like detached retinas, macular degeneration, cataracts and eye hemorrhages are also conditions Dean has had a good track record in helping and in some cases reversing the condition completely. As well, nerve deafness, tinnitis (ringing in the ears) and general hearing loss due to different factors seem to respond favorably to Dean's "touch". Various sports injuries also heal unusually quickly when treated with Dean's laying-on-of-hands technique. Dean has also had positive results working with asthma, emphysema, and cystic fibrosis. In terms of skin conditions he has been fortunate to help many patients with shingles, scleroderma and Raynaud's disease as well as many other ailments. Strongly believing in traditional medicine, Dean is not in conflict with doctors, but works as an adjunct alongside the physicians in a complementive manner. Over the years, hundreds of doctors have referred their non-responsive patients to Dean, as well as come to Dean with their own health ailments. These improvements, remissions and cures do not happen overnight -- it can take time and each case is different from the next, although approximately 25% of those treated by Dean do respond very quickly. There are never any promises or guarantees that Dean Kraft can help. That said, when medical science has nothing left to offer, instead of giving up when the doctors say "there's nothing more that we can do", there IS Dean Kraft. Dean has made himself available to laboratories around the country. Tested at Lawrence Livermore Laboratory in California, a government facility, Dean Kraft discovered that by holding flasks (test tubes) containing HeLa cervical cancer cells (the most virulent cancer culture used worldwide for research) and focusing his energy on destroying the cells, he was successful in killing the cancer cells. As the cornerstone of the scientific method is replication, Dean repeated these unique experiments at the Science Unlimited Research Foundation in San Antonio, Texas with bio-physicist John Kmetz, Ph.D. The results were unprecedented - Dean ended up destroying all of the live cancer cells in every flask he laid his hands on. This supports why Dean Kraft is so successful in treating most forms of cancer in patients. He was also tested at the U.S. government's "think tank", Stanford Research Institute (S.R.I.) in Menlo Park, California where he used his psychokinetic ability to move a pendulum under a glass bell jar over eight feet away just with the power of his mind. Dr. Erik Peper in the bio-medical division of S.R.I. discovered that when using an EEG machine hooked-up to both Dean and his "patient" there was a definitive synchronization of their brain waves. The scientist noted that this was an unusual paranormal result of their work together and it was a consistant finding with every person Dean worked with. This was confirmed again at Langley Porter Medical Center under the auspices of Dr. Joe Kamiya. The synchronization of brain waves was undeniable. When under the auspices of Astronaut Edgar Mitchell's Institute of Noetic Sciences, in H. S. Dakin's Laboratory Report, Dean effected electrostatic fields at will, as well as successfully participated in many other experiments designed to test his abilities. For example, he effected plant growth--his watered plants grew slower, but just as healthy as the control plants--a Fountain of Youth effect perhaps? Possessing many other paranormal gifts, Dean, who has a very skeptical nature -- he needs to see it to believe it -- continued to subject himself to other types of experiments. He was always testing the limits of his unusual abilities. Hearing of his extraordinary sensitivities, the New York City Police Department asked for Dean's help with a number of missing persons cases and a murder case, all that were still unsolved - and he provided valuable information leading to the identification of the murderer. Police Commissioner Murphy was very impressed and Dean was offered the opportunity to teach detectives how to heighten their own sensitivity in crime solving. The State of Florida was the first to recognize Dean Kraft's work when he was granted the first License to an energy healer under the Professional Medical Category of Mental Healing. Dean Kraft was also the first healer to be granted a non-profit research foundation, The Foundation for Psychic-Energetic Research. The goal of the foundation was to try to find others with a similar level of paranormal abilities as his own. Another main focus was to try to duplicate Dean Kraft's unique energy through inventing the technology with which to accomplish the task. Due to his dedication and desire to do research along with his huge bounty of documented case histories, Dean was asked to join the staff of Lincoln Hospital in the South Bronx, New York and became the first laying-on-of-hands healer ever to teach his own energy healing techniques to doctors and residents there. As Dean has seen so much fear, sadness and despair, HOPE, so tragically absent in traditional Western medicine, was a keynote in his teachings. His unique exploits have been included in numerous books of authors who wrote about the paranormal and alternative medicine. Talk shows and investigative news programs were interested in Dean from the very beginning of his career. Dean, along with his wife, Rochelle (his childhood sweetheart and devoted wife of over 33 years), wrote two books -- "Portrait of a Psychic Healer" in 1981, and then "A Touch Of Hope" in 1998 (both published in hardcover by Putnam and in softcover by Berkley). In their second book, in addition to writing about his then 25 year career as a healer, Dean and Rochelle shared Dean's own self-healing techniques with the readers. They described how readers can stimulate their self-healing systems in their own bodies. As well Dean also taught the readers how they could try to help their loved ones using Dean's laying-on-of-hands techniques through the power of touch -- especially when medical science has been exhausted. Dean was continually deluged with people seeking his help. Then in October 1999 NBC-TV aired a world-premier movie based on the true story of his life -- and second book -- also entitled "A Touch Of Hope". This movie was the first of it's kind on the subject of healing and the paranormal. Whenever it airs, demands for Dean's help reach astronomical proportions. This movie opened the door for many of the parapsychology television shows and movies that are popular today. For the next few years, Dean Kraft healed many, many of the people he saw, all deemed "hopeless" by their doctors. The following eight years Dean and Rochelle decided to remove themselves from the public eye. Dean continued his involvement in healing research and they wrote about his unusual life and experiences. This was their attempt at trying to create a "normal life" for themselves. Dean is now back in public practice with Rochelle by his side and teaching his self-healing techniques. Dean and Rochelle finally came to the realization that THIS was meant to be their "normal life". 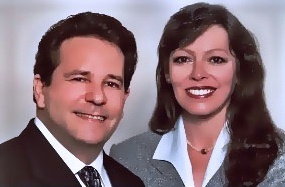 Dean and Rochelle, along with their research foundation, the Foundation for Psychic-Energetic Research, have compiled and will continue to add to this database of information and documentation that is being made available to the public, such as published articles, testimonials, scientific research, media interviews--including a video library. All of this will chronicle the history of the most scientifically studied and medically documented healer of our time. Also known as Dean Craft Healer. Dean Kraft was at the top of his 41 year career creating medical miracles by curing the incurable with the power of the mind when he was suddenly felled by a massive and fatal heart attack on October 27, 2013. Dean Kraft was proven to be the most medically and scientifically documented energy/psychic healer of our time. He was 63 years old. His childhood sweetheart, devoted partner of 45 years and beloved wife of almost 38 years, Rochelle Kraft, was at his side when the tragic event occurred. World renowned not only for his miraculous healings spanning four decades but he was also unique for his determination to prove his claims of an incredible healing gift and numerous other paranormal powers. Dean provided conclusive evidence of the authenticity of his gifts in numerous government laboratories, universities, and hospitals around the country. The phenomenal ability to kill the most virulent of cancer cells in test tubes (duplicated in several experimental settings) has yet to be reproduced by any other human. With his partner, Rochelle, they co-authored two books on his life – “Portrait of a Psychic Healer” and “A Touch of Hope”, both by G.P. Putnam. One year after “A Touch of Hope”, which covers 25 years of his unique career, the book was made into a television movie by NBC and aired worldwide on October 10, 1999. Dean Kraft will be remembered for his unfailing integrity, great sense of humor, tremendous warmth and generosity, unshakeable optimism and unwavering compassion for the sick and suffering. He will be sorely missed by his devoted wife, sisters Lisa Kubie and Roberta Levine and his nephews and nieces.